When the Organization of American States (OAS) asked Chilean poet Pablo Neruda to join a transnational literary collection, he answered: "I beg of you not to include my work in such publication. To the Latin American peoples, specially to the Chileans, the institution for which You work represents an instrument of the politics of Washington" (Dimmick, 1953). The OAS was UNESCO’s partner in the Latin American series of a literature translation project for world understanding. Why would an author not want to be a part of it? Choosing, translating, and distributing books were meshed with international politics. The collaboration with the OAS was one of countless connections UNESCO fostered. Indeed, the intricate network of state and private institutions working in UNESCO's literary projects often caused intentions to flow in meandering ways and get lost in translation. The mainstream Brazilian press in the late 1940s, for example, saw an association with UNESCO as a sign of progressivism at a crucial time when the country was just emerging from a dictatorship. The OAS, by contrast, had an older, different reputation. Neruda would later accept an involvement with the OAS; but these were changing times of tension in the continent, as the United States extended its engagement with culture and politics across its southern neighbors. In UNESCO's transnational publishing program, institutional alliances and points of intersection reveal ideological values attributed to the role of books and their translations during international conflicts. In World War II, literature was used for Allied propaganda: books were "weapons in the war of ideas." After the war, literature morphed into a tool for the internationalist dream: books for mutual understanding. Publishing moved from a world of competing national units to a one-world model of books propagated by UNESCO. If the same organizations in UNESCO's translation projects had operated before and during the war, the main difference lay in the attempt to reconcile the national and the universal. 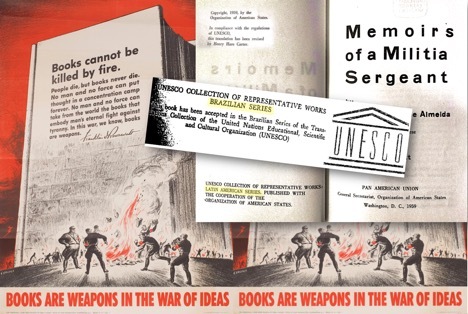 In the United States, the campaign for "books as weapons in the war of ideas" originated in the phrase by W.W. Norton, publisher and director of the Council of Books in Wartime (Hench, 2010). There was a strong business side to projects of this nature, and the world war model seems to have played out into the postwar and cold war period. The change was that now intellectuals and members of states and businesses met at the crossroads of UNESCO. In many cases UNESCO did not pay for the publications, but put the right people together and added great value to books through the UNESCO stamp of approval. The UNESCO meeting place as an intersection of the different realms invested in managing literature transnationally sheds light on how culture, market and politics worked together. In the case of Latin America, UNESCO documentation exposes particularly compelling tensions of inter-American cultural politics. The extensive correspondence arranging meetings in Paris for UNESCO’s translation projects covered different arenas ranging from national identities to printing budgets. In the definition of the program, the invited experts were supposed to search for cultural production that was at once universal and national as well as aim to promote mutual understanding among nations. These programs were one side of the cold war coin. Institutions represented at UNESCO defended transnational publishing as a vehicle that should spread freely across states; at the same time, they sought to control literature deemed unflattering of the states in question. This contradictory element of censoring while defending freedom of speech had been imbedded in cultural policy and surveillance apparatus since wartime. In 1949, a committee of experts sent an urgent reminder to member states requesting "national lists" of great works most deserving of translation. Two rather contrasting criteria were suggested. The selected works should be: "(a) representative of national genius; (b) of universal character." (UNESCO, 1949). Among the many countries and regions in this project, Latin America is an interesting case study because it points to the contradiction between the national and universal with the added complexity of the regional. Over one thousand books were translated with UNESCO’s support after 1948, in all genres and from a hundred different languages. The catalogue of UNESCO’s translations separates the categories “Latin America and the Caribbean” and “Europe and North America”, suggesting a problematic division of cultural regions in terms of political and economic powers rather than historical or geographical coherence. In the collection of representative works, among other genres, 261 novels were translated. There were 25 Latin American novels translated into French. Finally, 17 novels from Latin America were translated into English, the last one being published as late as 1998. Of those novels brought to English speaking countries, six were by authors from Brazil, three from Venezuela, two from Argentina, one from Mexico and one from each: Puerto Rico, Guatemala, Dominican Republic, Haiti, and Costa Rica. Turning back to the initial years of the project, while UNESCO's History of Mankind tried telling a story beyond nations, UNESCO's collection of representative works looked to export national identities alongside groups of countries perceived as unities, as is the case for the Latin American series. This speaks directly to another kind of war of ideas: the polarized context of cold war pan-Americanism. The Brazilian member of the UNESCO committee in 1949 was Sergio Buarque de Holanda, one of the fathers of Brazilian historiography. He was included at the last minute in the meeting list, and penciled in two days before. In the archives, the minutes of the meeting that led to the 1949 report reveal those two contrasting criteria — national and universal — in the making. In one of the sessions, Buarque de Holanda was discussing Brazilian literature when the meeting chair stopped him to say that UNESCO had invited the experts "not as representatives of their countries, but in their individual capacity." On the other hand, the director-general of UNESCO, Mexican Jaime Torres Bodet, addressed the committee thanking the experts for being there for such a noble cause representing their countries. Torres Bodet continued with yet another shift in scale: "Among the works of the mind, literature is probably the profoundest and most authentic expression of the human spirit" (UNESCO, 1949). The 1949 UNESCO file of the Meeting of Experts contains hundreds of letters with invitations sent to scholars and publishers. Penguin, Allen & Unwin and others were there, raising questions about translator fees while academics were debating what constituted a classic work of literature. Stanley Unwin wrote from Brazil to a colleague at the British Council, saying that governments treated books as "just another commodity", when they were actually crucial in the battle for freedom, he says — "pioneers in the world of ideas" (Unwin, 1957-1963). When Pablo Neruda was asked by the Organization of American States to join that transnational literary collection, the addressee of his negative reply was the director of the OAS cultural department, Erico Verissimo. Verissimo was a Brazilian writer who would soon become the most prominent novelist of the southern region of the country. Verissimo had his own book on Brazilian literature stamped as a "wartime book," in the "war of ideas" in 1945 New York. At the same time, however, Verissimo’s latest novel was being investigated by the FBI under suspicion anti-Americanism (FBI, 2011). While UNESCO and the OAS were discussing which books should be spread around the world and Unwin was defending free trade for books, the same states were controlling other books for political reasons. Cultural production was a weapon or a peace flag simultaneously; the actors and subjects were sometimes the same. The fact that there was a Brazilian series as well as a Latin American series is revealing of the tensions of pan-Americanism. Inter-American discourse often resulted in strategic generalizations of the southern part of the continent subject to US imperialism, resulting in the concept of "Latin" America. There was controversy over defining the Americas, as a whole, or Hispanic or Portuguese Americas. UNESCO was entering a politically charged field working on the ambitious search for the simultaneously national, regional, and universal. Both books seen in the image above, by Manuel Antonio de Almeida (1959) and Graciliano Ramos (1979), were landmarks of the Brazilian canon. When they were stamped to be "in compliance with the regulations of UNESCO," they were attributed universal value. They were defined at the same time as essentially "Latin American" (regional) in the first case and Brazilian (national) in the second; and both, finally, were chosen as exports for a one-world ideal (universal). In UNESCO's early years, Theodore Bestermann had said that among UNESCO’s endeavors, the literary one was the least successful due to the potential of literature to carry propaganda (1951). One decade later, Herbert Mitgang described a success, saying UNESCO's books and ideas "gate-crashed the minds of men everywhere" (1960). While trying to move away from ideological polarization, UNESCO's translation projects helped to delineate the borders of national, regional, and global political cultures. For some, this meant joining the cold war of ideas. "Books are Weapons in the War of Ideas" Campaign. United States National Archives. Series: World War II Posters, 1942 - 1945. Record Group 44: Records of the Office of Government Reports, 1932 - 1947. Detail on Front Page of Ramos, Graciliano. Childhood; Unesco-Sponsored programs and Publications. Representative Works: Brazilian Series, 1979. Cambridge University Library. Detail on Front Page of Almeida, Manuel Antônio de Memoirs of a Militia Sergeant; UNESCO-Sponsored Programs and Publications. Representative Works: Latin American Series; 1959. Harvard University Library. Bestermann, Theodore. Unesco: Peace in the Minds of Men. London: Methuen & Co, 1951. Federal Bureau of Investigation. United States Department of Justice, Subject: Verissimo, Erico Lopes. FOIPA [Freedom of Information/Privacy Acts] n° 1156463-000. (Obtained June 15, 2011). Hench, John B. Books as Weapons: Propaganda, Publishing, and the Battle for Global Markets in the Era of World War II. Ithaca: Cornell University Press, 2010. Letter from Pablo Neruda to Erico Verissimo, 1953. Copy in: Dimmick, Ralph Edward Ingalls. Letters sent to Ralph Edward Ingalls Dimmick, 1944-1997. Houghton Library, Harvard University. Mitgang, Herbert. “For a World of Readers.” The New York Times. October 9, 1960. Organization of the American States. Secretary General Annual Reports. 1955. SA Doc 200.15 Harvard Library. UNESCO. PHS/Conf. 5/1. Committee of Experts for the Translation of Great Books. Paris, October 31, 1949. United Kingdom National Archives. Great Britain Council Members, Sir Stanley Unwin, 1957-1963, BW 2/657.